Display the system-calling UI for your app’s VoIP services, and coordinate your calling services with other apps and the system. In addition to handling calls, you can provide a Call Directory app extension to provide caller ID information and a list of blocked numbers associated with your service. To configure your app to receive incoming calls, first create a CXProvider object and store it for global access. An app reports an incoming call to the provider in response to an external notification, such as a VoIP push notification generated by PushKit. For more information about VoIP push notifications and PushKit, see Voice Over IP (VoIP) Best Practices. Using the information provided by the external notification, the app creates a UUID and a CXCallUpdate object to uniquely identify the call and the caller, and passes them both to the provider using the reportNewIncomingCall(with:update:completion:) method. After the call is connected, the system calls the provider(_:perform:) method of the provider delegate. In your implementation, the delegate is responsible for configuring an AVAudioSession and calling fulfill() on the action when finished. To make an outgoing call, an app requests a CXStartCallAction object from its CXCallController object. The action consists of a UUID to uniquely identify the call and a CXHandle object to specify the recipient. For more information about registering and handling URLs, see Using URL Schemes to Communicate with Apps. For more information about initiating a call using Siri, see the INStartAudioCallIntentHandling protocol. After the recipient answers the call, the system calls the provider delegate’s provider(_:perform:) method. In your implementation of that method, configure an AVAudioSession and call the fulfill() method on the action object when finished. 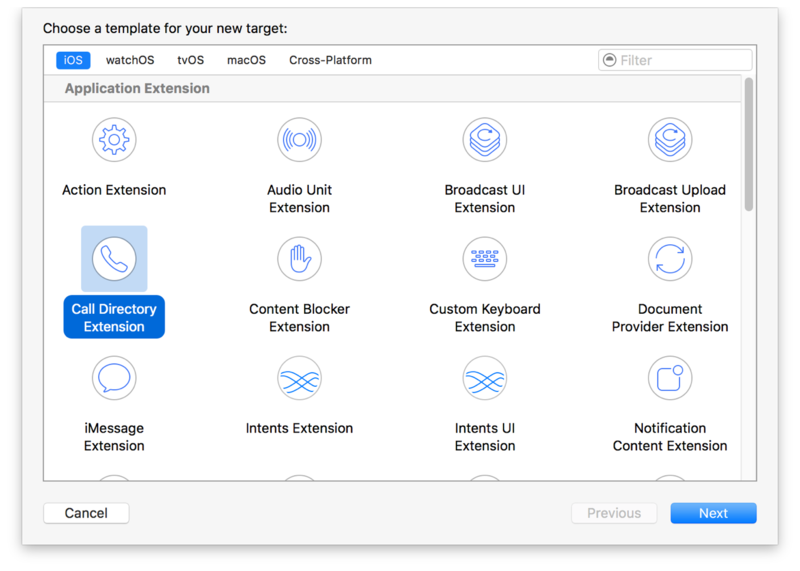 For more information about how app extensions work, see App Extension Programming Guide. To provide identifying information about incoming callers, you use the addIdentificationEntry(withNextSequentialPhoneNumber:label:) method in the implementation of beginRequest(with:). Because this method is called only when the system launches the app extension and not for each individual call, you must specify call identification information all at once; you cannot, for example, make a request to a web service to find information about an incoming call. When a phone receives an incoming call, the system first consults the user’s block list to determine whether a call should be blocked. If the phone number is not on a user- or system-defined block list, the system then consults your app’s Call Directory extension to find a matching blocked number. This is useful for apps that, for example, maintain a database of known solicitors, or allow the user to block any numbers that match a set of criteria. To block incoming calls for a particular phone number, you use the addBlockingEntry(withNextSequentialPhoneNumber:) method in the implementation of beginRequest(with:). You can specify that your Call Directory app extension add identification and/or block phone numbers in its implementation of beginRequest(with:). Call-related actions are routed through your provider and its delegate, which you use to communicate with your service. When a PushKit notification indicates an incoming call, you generate an appropriate action. CallKit handles the action by presenting the system interface for answering the call. Start outgoing calls with a call controller, and handle subsequent interactions with your provider delegate. Respond to actions reported by CallKit. Get information about calls, and be notified when the status of a call changes. A programmatic interface for an object that manages a list of active calls and observes call changes. A collection of methods that are called by a call observer object when a call changes state. A means by which a call recipient can be reached, such as a phone number or email address. Use a Call Directory app extension to block calls and provide caller ID information.